Going green is important in our day to day life. We live in a flat. It is part of a large complex of flats. We have many friends there. We all want to keep their homes clean and beautiful. To keep our homes clean we need to follow some rules. In even- home, we use food, clothes, paper and other things. We need to buy many things to survive. We need to buy fruit and vegetables, rice, dais and spices. We also need to buy biscuits, sweets and other food items. Some of these are sold in sealed packets. When we open them, we have to throw away the bags and wrappers. These may be made of paper, plastic or other materials. All this stuff is called garbage. To keep our housing complex clean and green we should follow certain rules. Vegetable and fruit peels, tea leaves and left-over food. Glass bottles, old newspapers, cardboard. The first group is made of stuff that will decay if it is buried in the soil. It is collected separately from the flats and put into a pit. At the bottom of this pit, there is some soil and lots of earthworms. Everyday, these earthworms enjoy their treat of garbage which they can eat! They turn this wet garbage into compost. For this reason, earthworms are often called the "farmer's friend”. The compost made by them is very good for plants. Gardeners use it to keep the complex lawns green. Material that will decay is called biodegradable. In many big cities, there are huge pits where waste materials are buried. These pits are called landfills. The wastes may be non-biodegradable or biodegradable. Tractors are used to push the material down. This is done often. Slowly, the layers at the bottom turn hard and new land is built up. 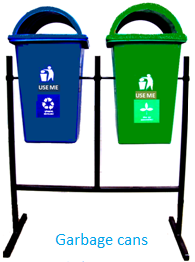 Some garbage items can be reused or recycled. The glass bottles and paper are often sold. The glass bottles can be broken and made into new glass. Similarly the paper can be made into a pulp and changed into other kinds of paper. However, there is a major problem with anything made of plastic. Even if plastic is buried for many years it does not decompose or break up into any other materials. For this reason, we should reduce the number of plastic bags we use! In many big cities, we can see garbage cans like these. The green one is labeled "biodegradable". The blue one is labeled "recyclable".